The Jazz has been a part of Honda’s range for over a decade now, but has never managed to gain the following or kudos of its bigger brother, the Civic. 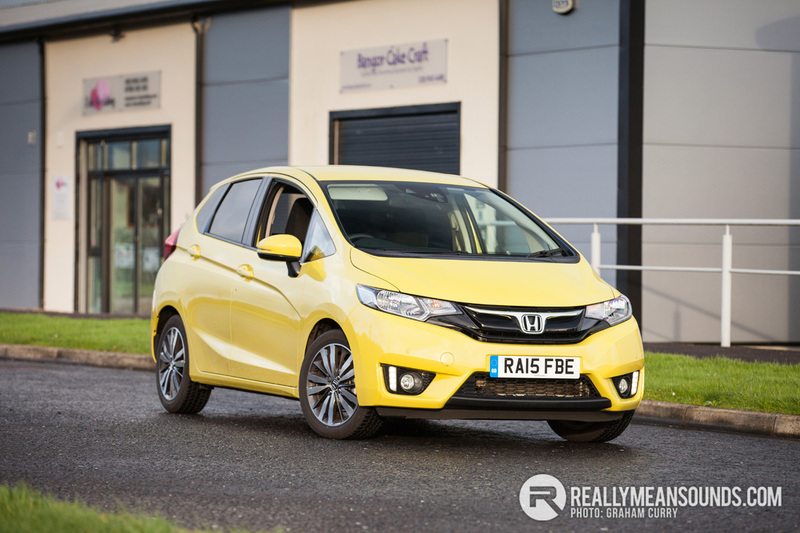 Known even more charmingly as the Fit in Japan, we review the latest iteration in the rather fetching “Attract Yellow Pearl”. A colour which made the Jazz very easy to pick out from afar in the car park. The Honda competes directly with the Skoda Fabia and Peugeot 208. Compared to the outgoing Jazz, this new model is sharper, stylish and has a significantly more design flair. The baby Honda gets the corporate face and shares obvious design cues, like the grille and headlights, with the bigger Civic. The Honda Jazz is well equipped – this is the EX-Navi version which gains full colour coding, rear privacy glass and 16″ multi spoke alloys. The outgoing model’s 1.4 engine has been dropped from the range in the interests of efficiency. The replacement is a 1300cc i-VTEC engine producing 101bhp with 91 lb/ft, which clicks 60mph in 11.1 seconds. The Jazz won’t win the traffic light grand prix with those figures, but the car has sufficient poke for town driving and light cruising. This engine responded perfectly to every cog I threw at it from the six speed gearbox. I can only assume the box was close ratio, as the car wasn’t long in getting through the gears even at low speed, which gave the car a zippy, zesty feeling. Over a two week period that I had the Honda Jazz, the average consumption over several hundred miles was around the 52mpg mark. The engine technology used in the car really does squeeze every last drop from the petrol tank and those economy figures are on a par with most of the torquey diesels I have driven recently. On the road the Honda Jazz lacked a bit of charm and dynamism; it was smooth, handled well and was effortless to drive – small family car that is suited best for the city. But it was a forgettable experience but pleasurable all at the same time. Inside the cabin was very roomy for a car in this category and the seats were very comfortable, with good bolster support and soft padding. Rear seating is aided with ISOFIX child seat anchoring system points and the rear leg room was generous. On longer journeys, my wife found the passenger leg room uncomfortable and slightly cramped due to the position of the bulkhead and under dash board area. On a whole the cabin was well built and solid throughout. The climate control settings were all touch sensitive which was a great twist and not expected, all within easy reach from the driver’s seat. Honda have really upped the game when it comes to infotainment. The highlight of this car was the 7” android based tablet that is built into the console. This model was also equipped with Garmin sat-nav and rear view camera, all of which was accessed through the screen. As tested, this Jazz was priced at just shy of £17k. With annual road tax of a mere £30. As expected, the Jazz was well engineered and robust. Everything expected from a Honda. It will provide a faultless city car experience. It’s smooth and easy to live with. It becomes part of the background. Pleasant but not attention grabbing. Just like jazz, I guess. The americans get a 3 door version of this 'Fit'. I really don't get why we don't get one as well. I know the article says it wants to attract a younger audience but looking at that, it won't. It looks like a mini-MPV. If Honda wanted a younger audience, they should be looking at what Suzuki is doing. Give it interesting options, make it affordable and you'll get them in the door. Or for the younger petrolhead, make a swift sport rival. Chuck a buzzy 1.6 in there, make it fun to drive, make it a type S or something. At 17k, I'd be looking at Fiesta STs, not this. the morons employed at HUK dont make things easy for the brand here; Japan needs to take hold of the reigns and stamp their authority on what goes on sale in terms of product, pricing etc. I wasn't sure if a 1.6i 150bhp engine would be enough to call it a type R, which is why I said Type S. A proper ST/RS Clio 200 rival with 200+bhp at that money, then yeah, Type R away. | I wasn't sure if a 1.6i 150bhp engine would be enough to call it a type R, which is why I said Type S. A proper ST/RS Clio 200 rival with 200+bhp at that money, then yeah, Type R away. 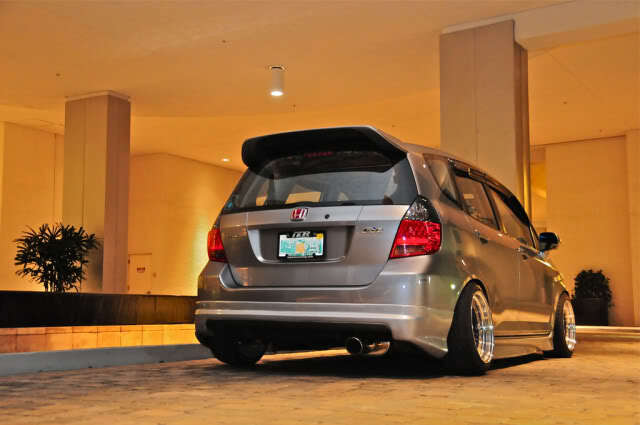 The new Honda Jazz, soon to be causing tailbacks on a road near you.